How Does the Bokashi One Bucket and Mix Composting System Work? Put simply, food waste is layered with a sprinkling of Bokashi One Mix, in a Bokashi One Bucket. 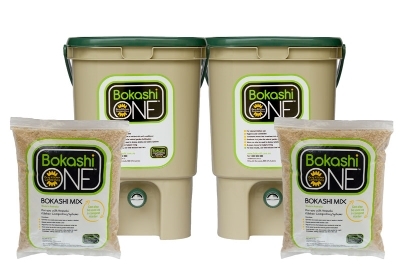 Due to the air-tight bucket and the micro-organisms present in the Bokashi One Mix, the waste ferments, the waste does not breakdown at this stage. The micro-organisms in the mix also ensure the waste does not putrefy. To complete the composting process the waste is transferred outside and buried beneath the soil. With oxygen, the micro-organisms accelerate the breakdown of the waste, supplying soil with nutrients and life. During the fermentation process inside the bucket, the waste reduces in volume due to the water content of the waste draining to the base of the bucket where it can be tapped out. This wonderful Bokashi juice is full of nutrients and is alive with micro-organisms it can be used in the garden and around the home. The Bokashi One system significantly accelerates the composting process. All kitchen waste, (which is a huge benefit of Bokashi One composting over worm farms or traditional composting), although it’s best to avoid large bones and excessive amounts of liquid. Do not apply directly to foliage. Bokashi juice is best if used within 24 hours after draining from the bucket. You may prefer to set up your system using two buckets. One of the benefits of having two buckets is the convenience. If you have only one bucket, when it is full the waste needs to be buried immediately to continue to use the system, with a second bucket the waste can be buried at a more convenient time before you fill up your second bucket. Also by rotating the buckets the waste has more time to ferment (especially good for homes that produce a lot of waste), the longer the waste ferments the quicker it will breakdown in the soil, and additionally, more wonderful bokashi juice is produced. You can always give us a call for help or advice! Call 1300 902 880. A Bokashi One Buckets or two and a bag of Bokashi One Mix. It’s that simple!